Big news for fans of Bus Rapid Transit and busways – there are now over 300 bus corridors around the world. ViveBus in Chihuahua, Mexico put the total over 300 when it launched this year. 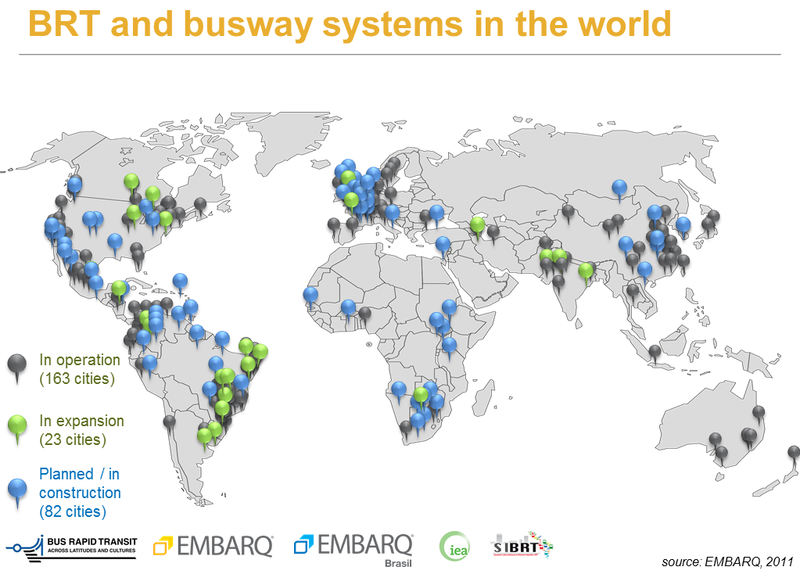 Advanced bus systems have now spread to 163 cities in 38 countries, totaling 305 corridors. There are now 4,256 kilometers (2,645 miles) of lanes dedicated to this burgeoning transport mode. The update was released this week in BRTData.org, a database that collects information on BRT and bus lanes on every continent. The increase in advanced bus systems and corridors around the world marks a monumental shift in attitudes and approaches over the past 20 years. Though busways were installed in a few cities – such as Lima and Curitiba – as early as the 1970s, advanced bus systems didn’t really take off until several years later. Beginning in the early 1990s, advanced bus corridors began to be built around the world in earnest. Rapidly developing countries have made the most use out of these new ways to move people towards job opportunities, leisure activities, or closer to their families. 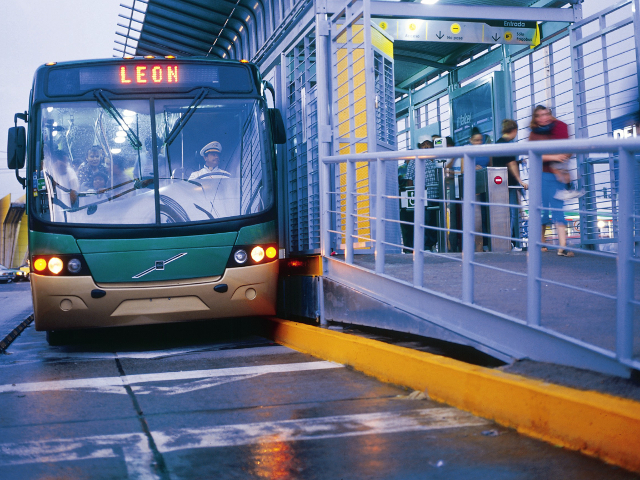 Latin American countries have built BRTs in over 55 cities, serving 18.33 million people every day. Asian countries have built BRT corridors in 33 cities, which serve over 8 million people every day. The affordability and speed of construction for BRT lines in comparison with the construction costs of rail systems (metros, or light rail) have made it a clear choice for developing countries with rapidly growing populations and transport needs. The 300th corridor, built in Chihuahua, will serve a city with about 820,000 inhabitants, which previously had one car for every two people. It is hoped the new line, which already serves 150,000 passengers every day, will help to wean Chihuahua residents off of their vehicle dependence, improve air quality, and relieve traffic congestion. BRTData.org was launched one year ago to track the progress of BRTs around the world. It represents the combined efforts of four global organizations: Across Latitudes and Cultures – Bus Rapid Transit (ALC-BRT); EMBARQ, the sustainable transport and urban planning program of the World Resources Institute (and producer of this blog); The Latin American Association of Integrated Systems and BRT (SIBRT) and the International Energy Agency (IEA). BRTData.org aims to increase community access to sustainable transport data on BRT and bus lanes worldwide. BRTData can be used by anyone, and provides data compiled from a wide range of other sources, including researchers, transit agencies, municipalities and non-governmental organizations. With BRT data so readily available, it will be easy to continue to track the meteoric rise of advanced bus systems around the globe. This post is based on a post originally published in Portuguese on TheCityFix Brazil by Luisa Zottis.